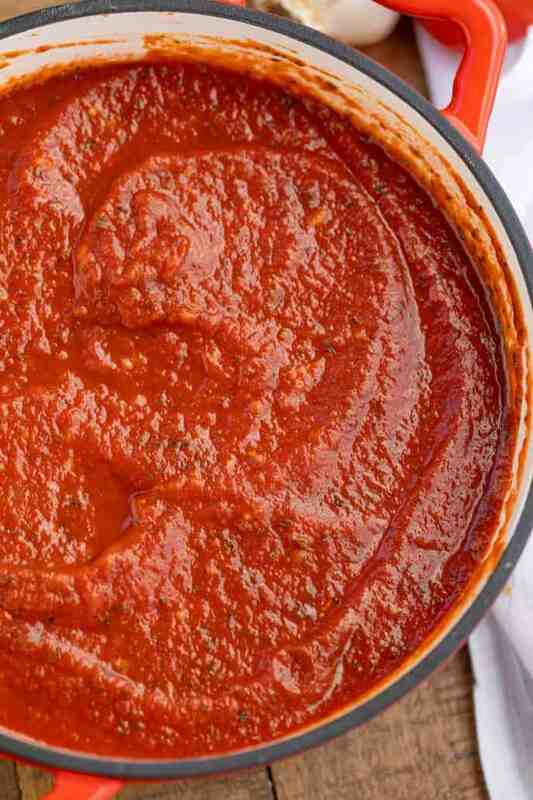 Quick and Easy Marinara Sauce, perfect for your favorite Italian meal. This homemade marinara sauce is done in as little as 15 minutes but perfect in 40. Five different add-in options for more flavors! We love working with homemade marinara sauce in our kitchen and using it in our favorite classic Italian recipes like Chicken Parmesan, Meat Lasagna, and our insanely popular Million Dollar Spaghetti. Quick and Easy Marinara Sauce is a staple recipe of mine, like my Enchilada Sauce. I usually make batches of it and keep it in the freezer for quick pasta meals. 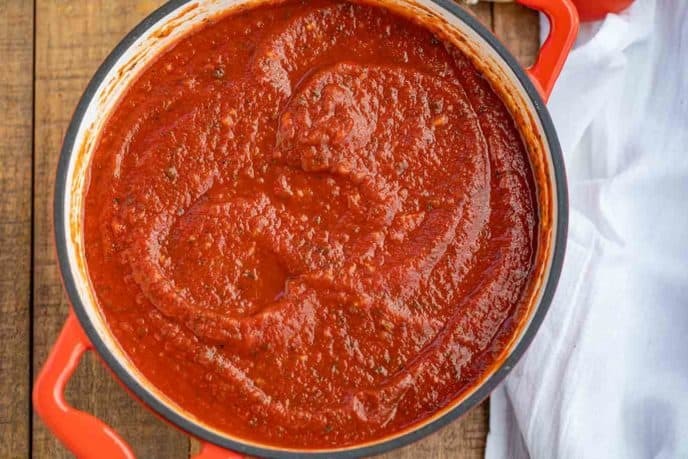 The best thing about this homemade marinara sauce, aside from being a base recipe, is that it is such an easy recipe to make. You can also adapt it easily for any other needs. One of the easiest things about this recipe is I intentionally created it to be easily scaled up or down. I always, without fail, make this recipe in quadruple batches and freeze the remaining three. This means I’m usually using 2 onions instead of 1/2 of one. I’m using 2 cups of broth instead of half of one cup. The thing about pantry staples is you’ll always be glad when you have them in your back pocket for quick weeknights that catch you unprepared. 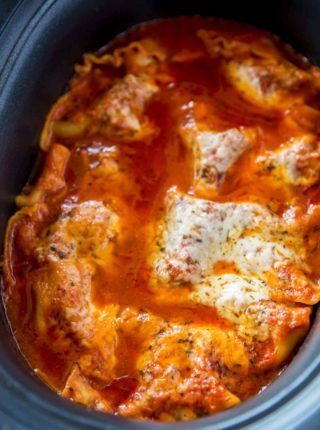 If you get home and nothing is planned you can thaw this sauce quickly, add to frozen meatballs or rotisserie chicken along with some pasta and you have a quick, healthy, and most importantly, homemade meal. Homemade Marinara Sauce Saves Money! For many years, I used to spend hours making marinara sauce or I would end up using a jar but it wasn’t until I started toying with quicker recipes that I realized I was wasting time and lots of money (good jarred marinara is not cheap!). Even using high-quality ingredients in this easy marinara sauce makes a delicious homemade marinara that costs just a few dollars. The most important part, no matter how much you spend on the jarred sauce, this sauce will taste better. It always will. Fresh garlic will always win, fresh cooking always wins over mass cooking and bottling when it comes to flavors. The key to the recipe is to use the best ingredients you can in your recipe. I list out some of my favorites below if you aren’t sure. Crushed tomatoes/Tomato Puree – I usually use San Marzano, but Cento and Muir Glen are also great options if they’re more readily available for you. If you’re using a brand that may be more inexpensive, taste the crushed tomatoes first, you may need a hint of sugar to tame the acidity or maybe a small addition of white wine vinegar if the taste is bland. Tomato Paste: I use Cento but really I wouldn’t stress the tomato paste. I even sometimes use giant glass jars of tomato paste from ethnic grocery stores. Fresh Garlic: If there are three places I don’t like shortcut products it is in jarred garlic, jarred ginger and bottled lemon juice, they NEVER replicate the fresh flavors well. Fresh Herbs: add them in at the very end or you’ll lose all the flavor benefits. Fresh Basil and oregano are great flavors for this recipe, I use it often when my plants are in full bloom. 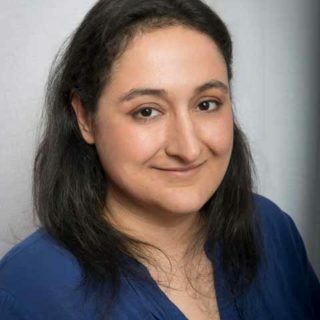 Dried Herbs: This is a pantry recipe, so I think dried herbs are great in this recipe, they add great flavor, they simmer well with the tomatoes and they freeze well. Just be sure your herbs have not been in your pantry longer than 6 months or they may have lost their flavors. Dried herbs may seem like they’re preserved but they do have a shelf life. Chicken Stock: I use Better than Bouillon so I can add as little or as much as I need and I can adjust the strength as needed. Many times I’ll triple the strength when making pan sauces. In this case I like it because my recipe only calls for a 1/2 cup. There are multiples ways you can play with this base marinara sauce to fit your recipes and tastes. That’s what’s great about this easy marinara sauce. It’s lovely on its own but a versatile base for different flavor profiles. Delicious meat sauce: swap chicken stock for beef stock. Brown your beef well, remove, brown your onions and garlic in a mix of the beef fat and olive oil. For a “sausage” flavor using straight ground beef, add some fennel seeds to the pot too. Angry red marinara sauce: Add more crushed red peppers to taste (I’ve done up to two full teaspoons) and add a much larger amount of garlic, I use up to 1/4 cup of minced garlic. Vodka Sauce: Add a 1/2 cup heavy cream and a 1/4 cup of vodka. Omit the herbs. This is best served with shrimp or chicken. Also top with healthy amounts of parmesan cheese. Creamy marinara sauce: simmer the sauce down to a thicker consistency, uncovered instead of covered, then thin with some cream. I also sometimes add a pinch of nutmeg since the cream adds a hint of sweetness to the marinara sauce anyway. Fresh Marinara Sauce: use fresh whole tomatoes and extra-virgin olive oil – go for a really juicy tomato, as ripe as you can find. Hard, Roma type tomatoes won’t make for amazing flavors, this type of fresh Marinara sauce is best made towards the end of summer when ripe red tomatoes are most available. Simpler, fresher flavors: sometimes I’ll use half the crushed tomatoes and add in fresh roasted garlic tomatoes. I usually do a couple of pints of grape tomatoes and skip the garlic in the base recipe since the garlic roasts on the grape tomatoes. Easy Tomato Soup: add chicken stock and some salt, pepper, fresh oregano and basil. We love adding this sauce to classic Italian recipes but it is just as easy to serve with easy pastas like Lasagna Soup, Stuffed Shells and Stuffed Peppers. You can even make it easy and serve it with easy things like tortellini, ravioli or meatballs and spaghetti for a quick meal. 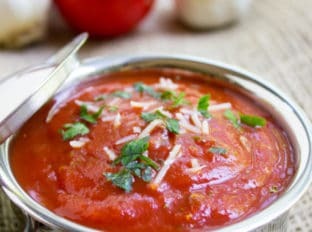 Quick and Easy Marinara Sauce, perfect for your favorite Italian meal. Done in as little as 15 minutes but perfect in 40. Five different add in options for more flavors! Add the olive oil and onion to the pan and sauté on medium low until very lightly browned. Add the garlic and let cook for 15 seconds or so until you can smell the garlic. Add in the rest of the ingredients and simmer, covered, on low for 30 minutes. The is THE best spaghetti sauce, hands down. I make mine w ground beef to make it a meat sauce but soooooo delicious. I could eat is all by itself! Never will buy store bought sauce again. Thank you so much, Janel. It’s so much more budget friendly too. This is a great recipe & so easy. I’ve used crushed & whole tomatoes. Both work great! I usually add 1 or 2 teaspoons of Chianti for a bit more flavor. And sometimes will sub the white granulated sugar with brown sugar. You can’t go wrong with this recipe. I’m so glad you love it, Sheri! I really appreciate the 5 star rating. Can you substitute the crushed tomatoes for diced tomatoes? Couldnt find crushed. Yes but it will be a chunkier consistency. You could always use an immersion blender to pulse a few times and thin it out, if you’d like. The BEST marianara sauce ever. Quick and easy to make. I highly recommend this if you like a thick, tomato sauce. Thanks so much, Debbie! I appreciate the 5 star rating. So glad you love it. This was my first effort and I cannot believe how much fun it was to make and it tastes wonderful! Am I able to can this? 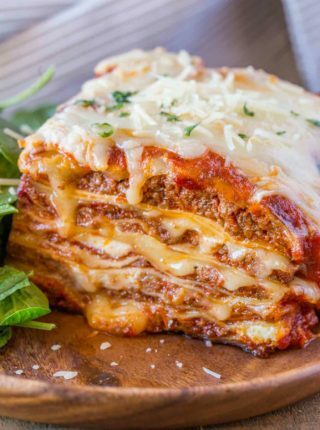 Will this marinara recipe make enough for your ultimate meat lasagna recipe or should I double it? This recipes makes about 4 cups of sauce so I would double it. Will one portion of the Quick and easy Marinara sauce be sufficient for the Ultimate Meat Lasagna? or do I need to make 2 portions? I do two, the lasagna is a beast! So glad you enjoyed them both, Alana! Hey! 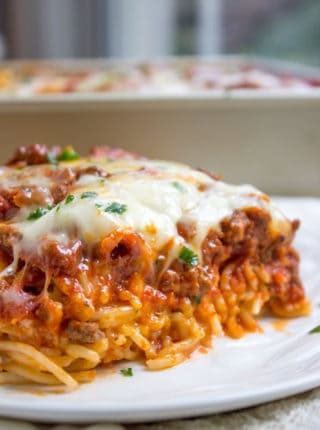 Do you use ground beef juice for your sauce when making your baked Spaghetti?!? No, I drain my ground beef. Just marinara sauce is amazing! It is now my go-to sauce. I make it in big patches and can it. My husband refuses to eat anything else now! I’m so glad you enjoy it! So much better than store bought too! It’s on the stove right now and it smells soooo good! I’m going to serve it with noodles and turkey meatballs! Can’t wait to take a bite! Sounds like a great dinner! Hope you enjoyed it! Looks so good!’ I want to make a batch and freeze a batch. Does it freeze well? If thawed in fridge overnight, what would you recommend for heating temp and time? Thanks! Yes, it freezes great! I put it in ziplock bags and lay it flat to freeze. Then to reheat I drop it on the floor or tap it against the counter to shatter, add it to a small glass bowl and cover with a wet paper towel and microwave to 2-3 minutes on half power. If you want to thaw in the fridge over night, I would put reheat it on the stove over a low heat. I have a question, approximately how much sauce does this recipe make? I’m making the million dollar spaghetti for a church dinner, I need to have some idea of the quantity to get the right amount of groceries. Sorry this comment took so long to get to, it ended up in my spam filter somehow! I’m sure the meal is long gone since it was for your church dinner, but it makes approximately 4 cups of sauce. Made this tonight to use on baked ziti and was very good and SO easy. I skipped the chicken stock, sugar, and salt. I will definitely make this again. Im sure it would be great for anything like pizza, lasagna, or spaghetti. I forgot the parsley, but it would have only made it better. What was it that made you rate it 4 stars? What would you have changed to make it 5? Seems a tad unfair considering on 6/12 ingredient were used. I seriously cracked up reading thi, silly. Just amazing and simple! Great for a busy weeknight or company too! Thanks! This marinara sauce is calling my name ! Well go ahead and make it! Enjoy! 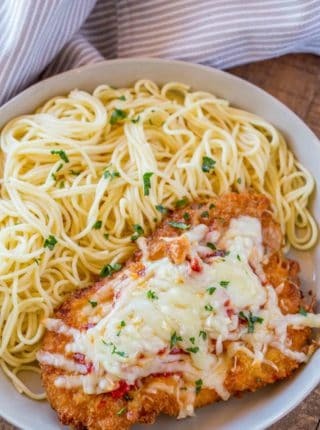 This looks delcious! I’m guilty of using the jar….I’ll have to give this a go! I’m glad I could give you an easy recipe to make it on your own! I love all the DIY recipes. So much better than store bought and this looks divine! This recipe absolutely keeper! pinned it. I was teary over Kobe, too!!! This recipe looks lovely! I am all about a simple sauce! I love homemade sauces and I am big on spaghetti sauce! However, sometimes a recipe just needs some marinara sauce and this looks so good! This sauce looks absolutely perfect and you know I’m a sucker for easy recipes 🙂 Can’t wait to give it a try! San Marzanos are the best! Once you have those everything else tastes sub-par! I even ordered mine from the internet and they were cheaper with the shipping! That way I always have some! Marinara sauce is so great to have around because you can use it for pizza, spaghetti, or sauce bases! Can’t wait to try this one! Yes, San Marzano tomatoes are wonderful, but if you want the ‘very best’ San Marzano tomatoes, the “Cento” brand is the one to go for. You can’t buy it in the supermarket….you can only purchase it online. If you want to use the best tomatoes in your sauces (Sunday Gravy), check it out. You won’t be disappointed. Great sauces. Thank you Sabrina.